Enjoy an evening of dinning at Zapata's Mexican Grill in the heart of downtown Texarkana. Musical entertainment by Two Piano's, featuring Josh Lawrence and Dr. Paul Whitt. Activities start at 6:00 p.m. Tickets are $100 (includes dinner for two). A cash bar will be available. Tickets are limited, call HandsOn Texarkana at 903-798-3211 to purchase. 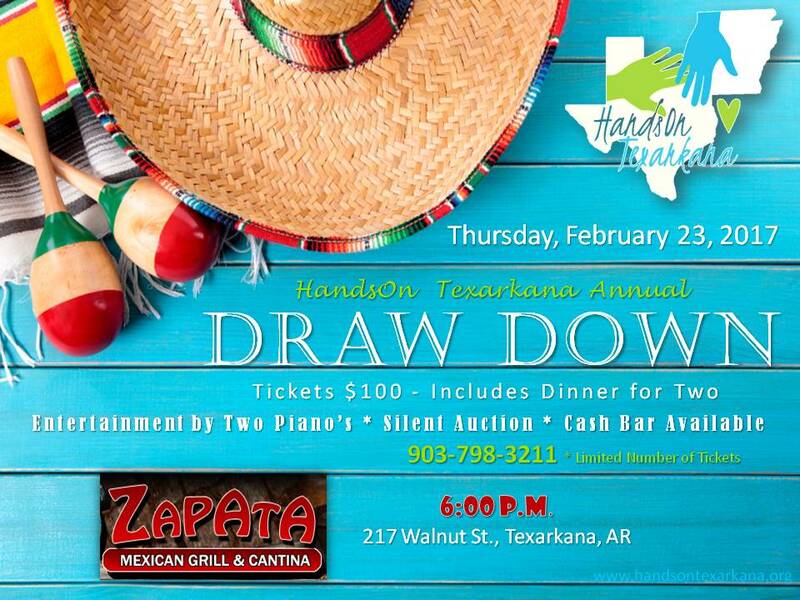 Draw Down Tickets and Silent Auction support the programs of HandsOn Texarkana: Youth Volunteer Organization, Skilled Parenting, Senior Transportation, and Disaster Preparedness. Learn more about the services of HandsOn Texarkana at Programs and Services. Can't make it to the event - but want to give? Go to our Donate page for information on supporting HandsOn Texarkana.